Matty Stenson has hit the ground running after joining from Barwell in the summer and admits it is a big weight off his mind. Coventry-born Stenson, whose 42 goals in 25 games for Leicester Road brought him to the attention of the Canaries, continued his prolific form last season, netting 20 times for the Evostik Northern Premier League side. Stenson wheels away after scoring his second against Albion. 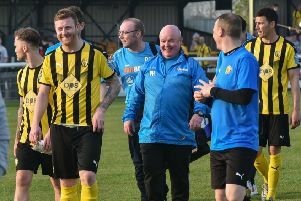 It encouraged manager Jimmy Ginnelly to tie him to a contract in March, only for the lure of the Conference North to tempt him to make the switch to the Phillips 66 Community Stadium two months later. The 24-year-old has continued his prolific form into pre-season with Brakes, netting six times in five appearances. And, after a meteoric rise which has seen him move from Step 6 to Step 2 in just over a year, the former Coundon Court pupil admitted the early run of goalscoring form has helped him feel comfortable in his new surrounds. “Yeah, a massive confidence boost,” he said. Stenson says work rate is just one of the aspects of his game that is similar to that of Danny Newton. “Coming into a new team at a higher level the first thing you want to do is get off the mark. After signing Stenson, Brakes boss Paul Holleran drew comparisons with the playing style and career progression of Danny Newton, who is now at Stevenage having also stopped off at Barwell and Leamington along the way. And Stenson, who came through the Academy at Coventry City before leaving due to family reasons and joining Hinckley United, says the similarities have given him confidence he can emulate Newton’s rise through the ranks to League football. “It’s a huge compliment. Being compared to a player who is playing in the League is a big compliment to any player. “He won’t remember but I played with Danny at Hinckley when I was just breaking into the squad as a youngster. “I am quite similar to him with his work rate and the way he heads the ball. “I just hope I can do the same and score some goals. “So far my career has been quite similar to Danny’s, starting from the bottom and working our way up. “He’s proven it can be done and I’m hoping I can do the same. Stenson has had to do it the hard way, however, after a rare hip problem threatened to derail his footballing career in its infancy. Two-and-a-half years were lost as a succession of specialists struggled to diagnose the cause of the pain and he faced the very real possibility of never kicking a ball again. He was eventually offered an operation with just a 50 per cent chance of success but he knew it was a risk worth taking in order to try and get back to doing what he loved. “Basically, at the top of my femur I had extra bone growing on the side so every time I lifted my leg the extra bit of bone was scratching the cartilage of my ball and socket joint,” explained Stenson. “It eventually got shaven off and my cartilage was pinned back down. Restored to full fitness the former midfielder made the move forward at Leicester Road and has not looked back since. After topping the goalscoring charts in his previous two campaigns, the qualified ground surveyor sees no reason to temper his ambitions at Step 2, showing a single-mindenness that will endear him to a Brakes fanbase that have been starved of a genuine goalscorer since Newton’s departure.